For the three years that Chris and Heidi Townsend owned Black Cap Coffee in Stowe, they felt like the business had a split personality, they say. In front, they were running a busy café that they both loved; in the back, they were roasting coffee for a growing network of clients. Last winter, the Townsends decided to sell the café (to Spanish native Laura Vilalta) and focus solely on the hot drinks. They serve those at their new spot, Brave Coffee & Tea Co., in the Cabot Annex plaza in Waterbury Center. Behind a glass wall in their new retail shop and roastery is a roasting machine that Chris Townsend, a former ceramicist, built himself (“and built and rebuilt,” he jokes). There, he roasts coffee for clients such as the Trapp Family Lodge. Out front is a mélange of gifts, as well as a counter where Heidi Townsend serves up what her husband calls “a traditional Italian menu of espressos and espresso coffee drinks,” such as macchiato and cappuccino (plus a not-so-traditional maple latte). On a wall behind the counter, shelves hold gleaming, copper-hued urns filled with a variety of teas — Heidi’s passion. “I spent all winter tasting tea,” she says, and jokes that she and her husband vie with each other to give their preferred beverage pride of place in the shop. He favors coffee; for her, tea “is a window into the rest of the world.” The loose-leaf teas for sale by the cup or the ounce include Jasmine Green, and a floral, addictive Coconut Oolong. Despite their allegiance to competing brews, wife and husband agree that the brewing of coffee and tea takes care and time — as evidenced by the high-end tea infusers they use and the Kyoto drip tower they plan to employ this summer for iced coffees. “Those little rituals in our lives, such as coffee and tea, are a way to savor and explore,” Heidi Townsend says. Find Brave Coffee & Tea Co. at 2657 Route 100, Waterbury Center, open daily. 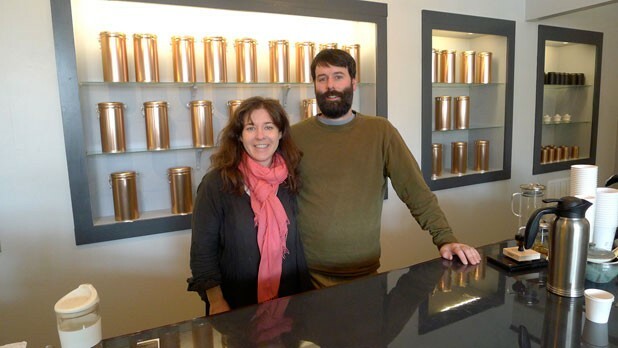 Downtown Montpelier gained its own tea mecca when the North Branch Café opened in mid-April at 41 State Street, in the old Chittenden Bank building. Its menu is a robust roster of teas, wines and small plates — without a drop of coffee or beer. North Branch’s tea menu is dense with greens, whites, oolongs, herbals and at least nine kinds of black tea, all from New York’s Harney & Sons Fine Teas and most served in double-walled-glass Bodum pots. Teas especially designed for kids come from Warren’s Groove Tea Project. The counter is loaded with sweet treats, including almond butter-crunch cake from the Bakery at the Farmhouse Kitchen and crème brûlée from Barre’s Delicate Decadence Bakery. Those join shortbread medallions (in flavors such as lemon-poppy, beet-orange-zest and fennel-anise) and even more shortbreads dipped in white or dark chocolate, plus an array of gluten-free pastries. The “other” liquids on offer at North Branch are wines by the glass; eight are kept fresh in Enomatic storage systems and offered in 1-ounce, 3-ounce or 6-ounce pours. North Branch’s opening wine salvo included Italian Spanna, Argentinian Pinot Noir and Finger Lakes Riesling. Parker says the wines rotate; by week’s end, customers can try an Aglianico, a Priorat and a rosé. The café lacks a commercial kitchen but is still serving up a range of savory snacks such as garlic-scallion kale chips, bowls of pepitas, hummus and tapenade, and cheeses from Midnight Goat Farm and Blythedale Farm, among others. Not surprisingly, Parker has noticed more women than men among the clientele, but she’s seen a range of ages, from high schoolers coming in to drink tea to couples taking advantage of North Branch’s late hours for a post-dinner date. “On the weekends, we’re open anywhere from 10 p.m. to midnight. We wait until the last movie gets out,” she says. Within a few weeks, Wes Parker will open a tech counter in the café to help customers with computer problems, encouraging laptop users to stick around. Regarding the absence of beer, Lauren Parker suggests that may change eventually. “It’s not something we’re going to rush into, though,” she says — tea and wine define North Branch’s niche. North Branch Café is open every day except Sunday. The print version of this article was headlined "Tea Tide"